The University of Chicago announced on Monday that it will release data on people stopped or arrested by its police department, a policy change in response to student and community pressure for increased transparency. The new policy will make public, for the first time, specific data regarding all traffic stops and interactions with pedestrians — referred to as field contacts — on a daily basis on week days, according to University of Chicago Police Department Chief Marlon Lynch. The data will include the race and gender of the individual, the reason for the stop, the disposition and other information. The university says it also will now provide arrest records upon request. The data will be released starting on June 1, Lynch said, adding that the university has not yet decided if it will publish data retroactively. The University of Chicago Police Department is a private police force of about 100 officers that has the same policing authority as municipal police officers. The department’s jurisdiction stretches roughly from 37th to 64th streets and from Lake Shore Drive to Cottage Grove Avenue, a 3.5-square-mile area that extends well beyond the university’s main campus in Hyde Park on the city’s South Side. 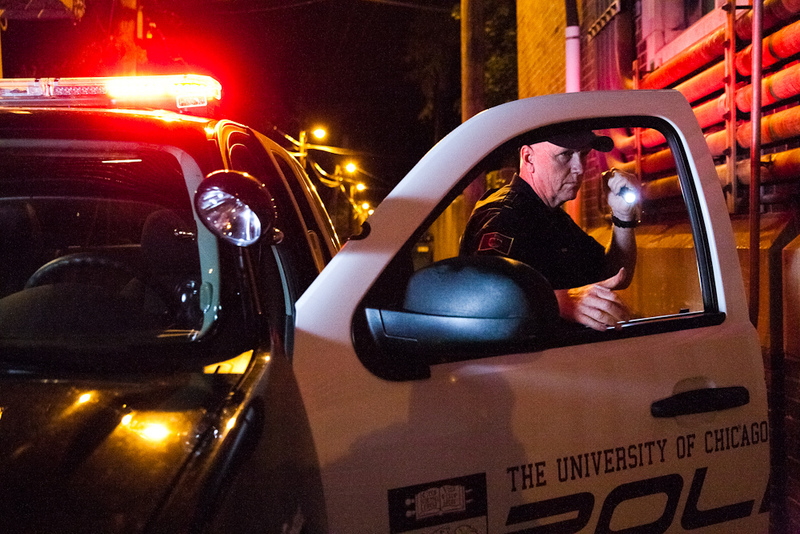 Despite its large patrol area, which includes about 53,000 residents, and its full authority to make stops and arrests, the university police department is not required to make its records public under the state Freedom of Information Act. Municipal police departments are subject to the act. Student and community activists responded Monday afternoon with cautious enthusiasm, commending the university for taking steps toward transparency while also saying that more needs to be done. “We’re encouraged, but it’s definitely not enough,” student activist Ava Benezra said. Benezra is a senior at the university and a leader in the Campaign for Equitable Policing, a student-led organization that has been advocating for changes in university police policies since April 2013. She has also been in several meetings with university administrators regarding the changes announced Monday. “It leaves control in their hands,” she said, listing some of her concerns with the new policy. “It’s a voluntary process that they can end at will. They get to define what constitutes a stop that they write a contact card for.” A contact card is a record of a stop that a police officer makes. Still, the policy is a big win for community members, who will now have data against which to assess their concerns about unfair policing and racial profiling. The change comes as a bill is being considered in the Illinois House of Representatives that would apply the state’s Freedom of Information Act to private university police forces like the UCPD. Lynch said that the transparency initiatives have been in the works for weeks and were not influenced by the introduction of Currie’s bill. Several months ago, a policy spelling out when an officer can make a traffic stop was changed. It may be more significant than the new transparency regarding racial profiling. Under the policy, it’s no longer enough for a vehicle to violate a traffic law, there must also be a safety or security risk associated with the violation for the vehicle to be stopped, Lynch told The Reporter. For example, officers are no longer supposed to stop someone who runs a stop sign, unless there is also a pedestrian in the crosswalk, making it a safety issue. He said that the department has already seen a reduction in traffic stops under that new directive, but he didn’t provide data to support the statement. University officials and community members underscored that Monday’s announcement should be the start of an ongoing conversation about policing. Jonah is a reporter for The Chicago Reporter. Email him at jnewman@chicagoreporter.com and follow him on Twitter @jonahshai. For the first time, UCPD is releasing data on community stops, but advocates want the police force to be subject to a fuller accounting under state public records laws. The July 19 fatal shooting of an unarmed black man by a University of Cincinnati police officer is raising questions about the authority granted to campus police officers in the Chicago area and elsewhere. Illinois lawmaker says legislation is the only way to ensure that the University of Chicago Police Department will be transparent.